St. Anthony’s Medical Center, a Level III Trauma Center, sits at roughly 9,100 feet above sea level in the mountains of Frisco. The Medical Center has a Flight For Life Colorado operation base on-site that works hand-in-hand with St. Anthony’s to save the lives of people with critical injuries within a 120-mile radius in Summit County. On July 3, 2015, a tragic helicopter crash occurred during takeoff, taking the life of pilot and decorated veteran Patrick Mahany. Two flight nurses miraculously survived with critical injuries. The Flight For Life Mahany Heroes Park is located on the helicopter crash site and recognizes these heroic crew members, along with the 15 courageous bystanders who ran into the fire that day to help. 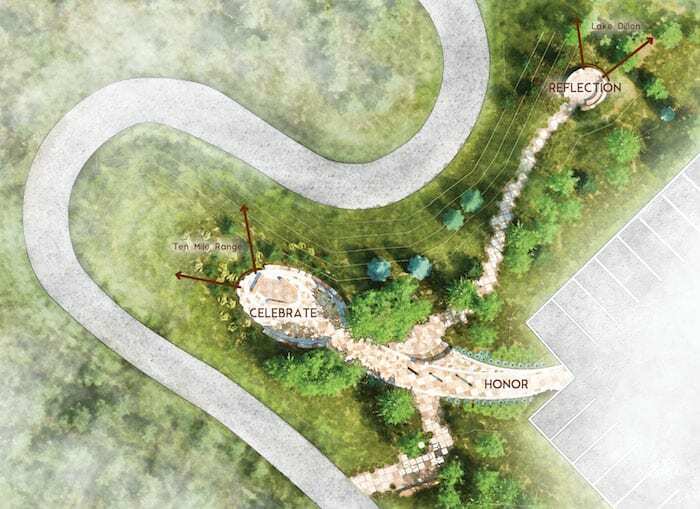 The design of the Park creates specific areas to honor, celebrate and reflect the courage of the people and professionals who choose to put the lives of others above their own on a daily basis. Adjacent to Forest Service land along the Summit County Recreation Path and the Medical Center parking lot, the park is easily accessible to the community and medical center staff. Though the site is small at approximately 0.2 acres, the emotional impact on visitors is monumental. 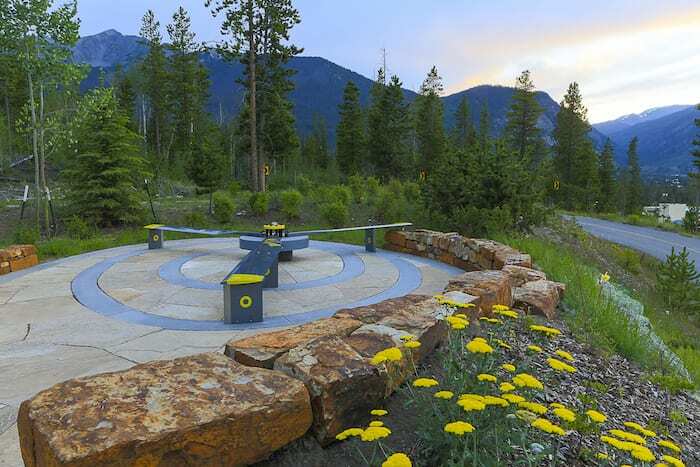 The Flight For Life Mahany Heroes Park serves both as a memorial for the cherished life of Patrick Mahany, and as a healing ground for all in this close-knit community who were affected by this tremendous loss. From the start, a community focus in designing the Park led the way. Lead landscape architect Norris Design joined with a local landscape architect Kim Kramer to collaborate on the design. The first priority was to assemble a team with individuals who personally knew the crew members and who were from the surrounding community. Members of the team offered their individual talents, skills and donations throughout the process. These were not only an incredible gift to the project, but helped uncover the uniqueness of the Park’s meaning as crew members, family and medical staff told their stories and contributed their viewpoints. The visioning process is crucial to every project, but in this case, it played a unique role in helping the community come to terms with the tragedy. 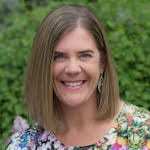 The steering committee, composed of Karen and Crystal Mahany, Dave Repsher, Matt Bowe, Julie and Kevin Kelble, Peter Werlin and Eddie O’Brien, wanted to be sure that the process involved the community in every way possible. The design team organized community outreach options for both small and large groups, an open house, displays at public events and assisted with presentations to local municipalities. One-on-one interviews with Patrick’s family members gave the team personal insight into his life, his work and his dedication as a first responder. Initially, the first interview posed the question “How can we tell Patrick’s story?” As visioning progressed, this focus evolved into “How can we tell the story of all those who run toward danger, not away?” Patrick’s life became the foundation on which the team built the vision of honoring so many who put their lives at risk every day. Three concepts unify the Park’s design, coming together in specific areas to support the visitor experience in a variety of ways. The concepts – honor, celebration and reflection – are represented in three main spaces. These spaces are tied together overall by an intricate wind pattern, replicating the ones that helicopters create as they take flight. The sweeping lines from the wind direction are visible in the arrangements of both hardscape and landscape throughout the Park. 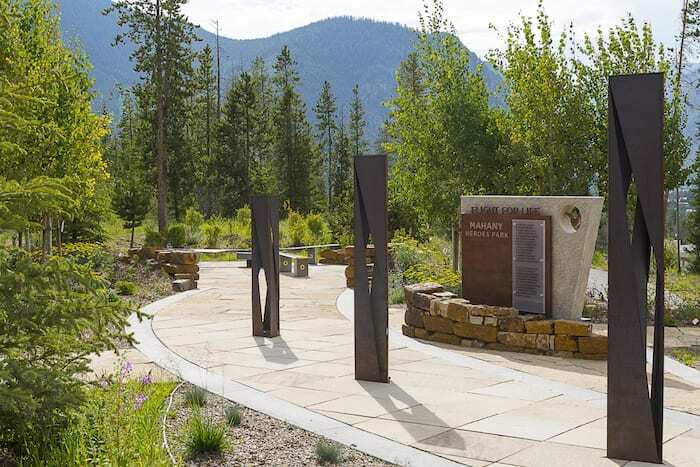 The honor space welcomes visitors from the main entry with ornamental grasses, dimension-cut flagstone paving and three large steel pillars that represent the three crash victims. The pillars are illuminated at dusk and dawn by dark sky-compliant lights, shining down and onto the path. Standing at various heights, they guide visitors into the Park. Another entry way is located off the recreation path that borders the park, a way to honor the citizens who were biking in the area that day and stopped to help. The simple entry sign tells the story, explains the park’s purpose and pays tribute to those who run toward danger when help is needed. The celebration space is a place to share stories and engage with others, and it represents Patrick’s contagious sense of humor and colorful personality. Designed as a warm place for gathering, 15 aspen trees frame the entry, symbolizing the 15 bystanders who ran to the fire that day. The trees and the vibrant perennial beds underneath serve as a landscaped gateway to transition visitors from the honor space into the celebration area – from formal to organic. The Flight For Life crew worked closely with avalanche rescue dogs in the county, and Patrick had a soft spot for each of them. Their paw prints are etched into pavers that lead into the space. Circular stone walls enclose and provide seating in the area for visitors to gather comfortably. The celebration space’s focal point is a bench made from the actual helicopter blades of an AStar AS 350, donated by Air Methods. The three blades reach out into the space, providing seats for visitors to enjoy breathtaking views of the surrounding area. One of the blades is oriented toward Vietnam, where Patrick flew 1,200 combat hours and was shot down three times, earning both a Bronze Star and a Purple Heart. This area is at the heart of the design’s overall wind pattern, creating a dominant ripple effect into surrounding curvilinear concrete bands. The reflection space is far removed physically from the rest of the park. The journey there is designed to evoke reverence, as visitors walk closely to the edge of the hillside, feeling a sense of discomfort and uneasiness that echoes first responders’ experience in the face of danger. Dragonfly outlines are etched into pavers: a symbol that holds great importance for Patrick’s wife and a reminder that we are not on this journey alone. The curved wall and cantilever stone bench provide comfort and security. A view of Lake Dillon in the distance references Patrick’s love for water activities and serves as a symbol of reflection. Patrick’s son worked with a local artist to design a copper plaque set within the retaining wall, describing the impact of Patrick’s life. Rich in symbolism, natural beauty and emotional connection, Flight For Life Mahany Heroes Park is a monument to the best in all of us. 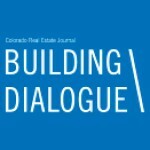 Published in the June 2018 issue of Building Dialogue.